Empowering women and girls and promoting gender equality are priorities for development programs throughout the world. The U.S. Government has intensified its commitment to the health of women and girls, recognizing that gender-related inequalities and disparities affect women’s and girls’ health, their risk of HIV, and the health of families and communities. The U.S. President’s Emergency Plan for AIDS Relief (PEPFAR) is also committed to integrating gender equality in its programs and policies to ensure that women have access to family planning, reproductive health, and HIV prevention and care services in the overall effort to improve women’s health. The Health Policy Project (HPP) integrates gender in its family planning, reproductive health, HIV, and maternal health activities. HPP provides technical leadership and builds local capacity to translate the Women, Girls, and Gender Equality (WGGE) and PEPFAR gender principles into action. HPP also emphasizes collaboration in these efforts with other donors and harmonization with multilateral gender and health frameworks advanced by the World Health Organization (WHO), UN Women, UNAIDS, and others. HPP provides technical assistance to local health institutions and national-level leaders to enhance their ability to assess gender-related health policies and provide equitable access to family planning, reproductive health, and HIV services. Our activities include a focus on reducing gender-based violence, which increases HIV risk. We conduct women’s leadership training and mentoring to strengthen women’s roles in defining country priorities and using evidence to advocate for support for family planning and reproductive health. We work with local partners to strengthen the policy environment to advance the health of women and girls and to promote gender equality. To advance global understanding of gender in health policy, HPP develops tools and methodologies that civil society groups, program managers, and health officials can use to identify gender-related barriers and policy gaps. Such analysis helps decisionmakers set priorities to address the healthcare needs of women and girls and improve gender equality. HPP also promotes increased use of evidence in HIV policymaking and programming for women and girls. HPP collaborates with government agencies, national and international organizations, women’s associations, donors, and other stakeholders to strengthen their capacity to advocate effectively for increased commitment and resources that improve women’s health. As a result, these individuals and groups are better equipped to influence policymakers to give increased support to maternal care, family planning and reproductive health, and HIV prevention services—all programs that enhance the quality of life for women, girls, and families. 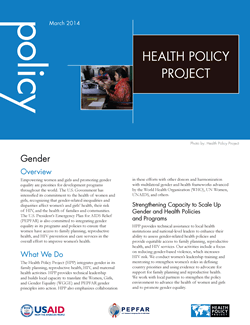 The Gender, Policy and Measurement program, funded by the Asia bureau of the U.S. Agency for International Development and implemented by the Health Policy Project (HPP) and MEASURE Evaluation, undertook a comprehensive, systematic review of the impact of gender-integrated programs on health outcomes. The findings are primarily intended to inform the work of government officials, donors, nongovernmental organizations, and other key stakeholders involved in health programming in India, as well as other low- and middle-income countries around the world. Developed by the USAID-funded Health Policy Project, the Integrating Gender into Scale-up Mapping Tool is designed to provide program managers with a methodology to systematically integrate gender into scale-up initiatives. Gender assessment exploring the normative, socio-economic, and power dynamics and political variables that impede and/or facilitate access to and use of health services in Timor-Leste. A literature review identifying the determinants of gender sensitivity within the Afghanistan healthcare system and documenting examples of best practices and successful programs from surrounding regions and countries. The literature review also documents the steps taken by Afghanistan's Ministry of Public Health (MOPH) to integrate gender into its many activities. Working paper analyzing whether gender factors in planning and scaling up programs improves the effectiveness of that process. Working paper examining policy issues associated with scaling up family planning and maternal, neonatal, and child health programs. HPP's Gender, Policy, and Measurement program (GPM) has designed an approach to help countries advance the systematic integration of gender equality into the scale-up of FP/MNCH interventions and best practices. The approach draws heavily on the process for integrating gender equality into programs and policies. Included in this suite of materials are a brief and two posters. Brief about HPP efforts to strengthen the capacity of local Health Facility Operation and Management Committees to promote gender equality in provision of health services in Nepal. Report from expert meeting on experiences with scaling up best practices in family planning and maternal, neonatal, and child health.